According to Statistics Canada, new motor vehicle sales surged to 124,058 units in February, up from 111,917 units in January. This beats the market forecast of 116,000. The last time car sales eclipsed the 200,000-mark was in June 2018. The stats agency also reported that manufacturing sales slipped 0.2% in February to $56.6 billion. The sector was ostensibly affected by motor vehicle assembly and wood products industries sliding 4.4% and 5.9%, respectively. Economists did not anticipate any change for February. When you exclude car sales from the equation, then manufacturing sales were up 0.2%. On the data front, investors will look ahead to the inflation rate on Wednesday and retail sales on Thursday. Business confidence is at its lowest level in three years, says a new Bank of Canada (BOC) study. The central bank’s first-quarter survey of executives found lower projections for sales, as well as a steep drop in the number of businesses reporting labor shortages. The BOC’s composite measurement of sentiment turned negative and slumped to its worst point since 2016. The BOC cited a slowing global economy and growing trade tensions for sliding private sector confidence. The main headwinds are a more uncertain outlook in the Western Canadian energy sector, continued weakness in housing-related activity in some regions, and tangible impacts from global trade tensions. BOC Governor Stephen Poloz takes a lot of stock into the survey, using it as a gauge for policy decisions moving forward. The report will likely be caused at the next policy meeting on April 24, where it is widely expected that the Ottawa-based central bank will not raise interest rates. In energy markets, May West Texas Intermediate (WTI) crude oil futures rose $0.22, or 0.35%, to $63.63 per barrel on the New York Mercantile Exchange. Oil remains one of Canada’s biggest exports, so the country’s economy is sensitive to price swings. 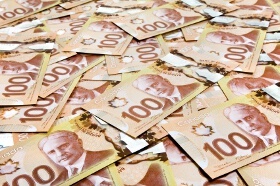 The USD/CAD currency pair decreased 0.11% to 1.3353, from an opening of 1.3369, at 16:10 GMT on Tuesday. The EUR/CAD plunged 0.26% to 1.5071, from an opening of 1.5111.